Remember the days when the Game Boy was the hottest gaming console on the planet and people just wouldn't stop buzzing about every new version that was going to be released when it would be announced? There was the colored Game Boy, the Game Boy Pocket, the Game Boy Lite, the transparent Game Boy (which is the one I have!) and then the Game Boy Color. So many (Game) Boys and so little time! It sold over 118 million units worldwide during its run so you could say that it was one helluva popular handheld gaming console during its prime. And while other gaming systems have overtaken the Game Boy in terms of technology and popularity, iPWN! honors the iconic handheld by letting you turn your iPhone or iPod Touch into a Game Boy–at least on the outside, that is. iPWN! is actually a freelance business run solely by a graphic designer based on Boston. 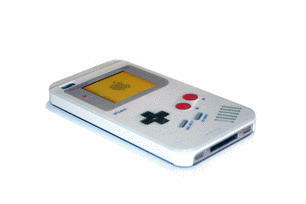 While the site currently offers only the Game Boy cases, he hopes to continue making cases tailored for these iPod gadgets in the months and years to come. Slim fit design (only 2 millimeters thick!). Full access to peripheral ports and buttons. 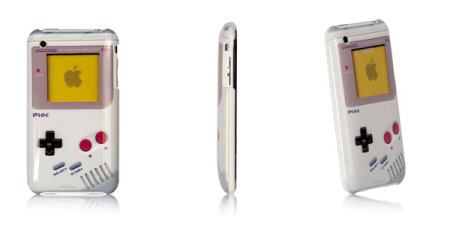 Durable yet lightweight polycarbonate material (under 1oz.). IML (In Mold Labeling) technology provides 3 layers of protection to the case, preventing color fading and resistance to moisture.